Designed with your on-the-job needs in mind, the new Fluke 62 MAX infrared thermometers are everything you’d expect from the experts in measurement tools. P54 rated for dust and water resistance. 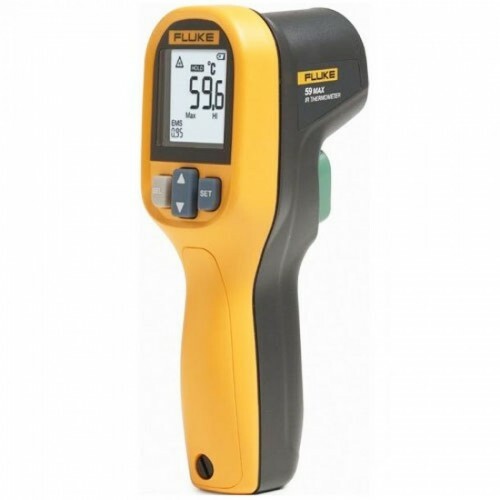 In fact, the 62 MAX are so tough, they’re the only IR thermometers around you can handle without care. Dual lasers : The 62 MAX+ has dual rotating lasers to help you identify area to be measured. The measurement area is the spot between the dots. Large, backlit display : Large screen makes data easier to read, even in dark areas. Min/Max/Avg/Dif : Displays the minimum, maximum or average temperature, or the difference between two measurements. Alarm : Hi and Lo alarms for rapid display of measurements outside the limits.